The sustainment warfighting function is related tasks and systems that provide support and services to ensure freedom of action, extend operational reach, and prolong endurance (ADP 3-0). The endurance of Army forces is primarily a function of their sustainment. Sustainment determines the depth and duration of Army operations. Successful sustainment enables freedom of action by increasing the number and quality of options available to the commander. It is essential to retaining and exploiting the initiative. The sustainment warfighting function consists of three major elements: logistics, personnel services, and health service support. See pp. 1-37 to 1-56 of SMFLS4: Sustainment & Multifunctional Logistics SMARTbook, 4th Ed. for further discussion. See pp. 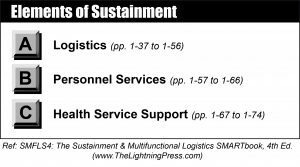 1-57 to 1-66 of SMFLS4: Sustainment & Multifunctional Logistics SMARTbook, 4th Ed. for further discussion. See pp. 1-67 to 1-74 of SMFLS4: Sustainment & Multifunctional Logistics SMARTbook, 4th Ed. for further discussion.